Three questions have dominated historical discussion of Cornish Methodism. First, why did it hold such an appeal for the Cornish? Second, in what ways was it ‘different’ from Methodism elsewhere, or indeed dissenting nonconformity more generally? Third, what effect did Methodism have on Cornish society? The pages here treat these three – causes, differences and consequences – in turn. But first, what was the context? John Wesley followed his brother Charles to Cornwall in 1743 and his message proved immediately attractive. On his very first visits large numbers of people turned out to hear him preach in the open air. Even the opposition stirred up by some local gentry during the politically sensitive time of the Jacobite rebellion in 1745 could not prevent a growing interest in what the Methodists were saying. It wasn’t long before chapels began to appear, especially after the 1760s. By 1785 over 30% of Cornish parishes contained an active Methodist society. 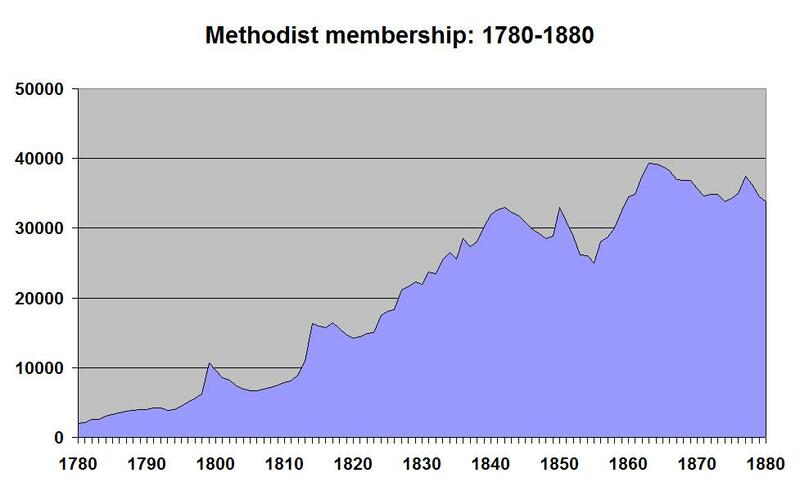 Growth then really accelerated and by 1815 the vast majority of parishes (83%) possessed a Methodist presence. By the time of the Religious Census of 1851 a higher proportion of Cornwall’s church-going population attended a Methodist chapel than anywhere else in the British Isles. The hegemonic hold of Methodism over the Cornish people was rivalled only in the other Celtic regions of north Wales and the Isle of Man. Pingback: Village raffles and the Cornish Methodists | Notes from the U.K.